If you’re trying to manage payees with only QuickBooks™ then you are probably aware of the maxim “the right tool for the job.” QuickBooks™ is a great program for what it is designed to do, but managing payees is not within its job description. That is where RPM comes in. Sharing the load makes for a lighter load and RPM and QuickBooks™ working together takes the best of both and returns a superior product: payee management that is easy yet comprehensive. At a glance view of all the bills for each payee. Quickly edit and add new bills. Pay the bill with one button. For the best of both: RPM for payee management, bill paying and back payment monitoring and QuickBooks for printing checks, specific reports and reconciliation. Preset imports for payees and vendors right out of QuickBooks and also full CSV imports for all three, payees, vendors and relations. “Execute All” will make all the deposits, pay all the bills ready to be paid and generate all the payee payments, in one single click. Export the results to QuickBooks and start printing checks. Complete overview of the account summary, check register, personal alerts, bills, notes, back payments and relationships, and single click access to add to or edit any one of those. Auto calculation of back payment balance and alerts on the home page and the payee’s dashboard. Each active back payment has an auto calculation help bubble to assist in determining a payee payment override amount in order to zero it out by the resolve date. Who’s over resources? Which bills are coming due or late? Who has back payments and what is their balance and resolve by date? Which fields are missing important data? Who has a birthday coming up? Answers to all these questions on the front page for a complete overview of all your payees. Payee account balances, payees and their vendors, vendors and their payees, payee income including pending back payment deposits, who’s homeless, who’s not and where are they living and how much they pay, who has back payments and what is their status and many more reports. In addition, most reports are exportable to CSV/Excel. Lists all the income sources, the checking balance, bill totals, checking reserve, if any, total monthly spending, auto calculated single check amounts based on what you set for this payee, balance after execution amount, payment override with its own balance after execution and the pay dates for every check created for the payee. Option to not print checks until later. The summary for each payee displays checking balance, income sources, total income, active bill totals, reserve, total spending for the month, and based on the payment frequency you set for the payee, how many paychecks and how much each will be, including the pay dates, the balance after execution for both the system calculated spending and the override spending. 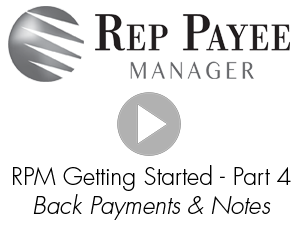 The easy to see interface lists all the bills for the payee, the due date, whether they will be included in the next execution or not and if they are suspended. As each bill is paid, the date increments to the next month automatically, unless you’ve set an end date. The legend clearly shows you the meanings in the Amount and Inc columns. Just one glance and you will understand where this payee is with regards to their back payments and any possible resource issues. The due and resolve by dates, the amount, the status of deposited and resolved. Hover over the help bubble and you get a calculation of what needs to be added to the system calculated paycheck amount, which you would enter into the payment override. Access to bills, relationship contacts, back payments, check writing, deposits, the payee’s check register, and unlimited notes. Optional Payee payment check amount limit threshold.